"Michael Henderson will make you stop and think about possibilities - for peace in our world, our communities, and our own souls. In his captivating style, he writes about miracles small and large that raise hope that the longings of all human beings to give and receive forgiveness and understanding might someday be fulfilled." "This book deserves serious study for the point it makes - that changes of heart are key to changing conflictual relationships. That point has earned a place at the center of the political resolution of conflict." "Sometimes history, selective history, gets us by the throat, threatening revenge and breathing new life into a chain of repression and retaliation. Here, however, in this book on the possibility and power of forgiveness, courtesy of Michael Henderson, we have a selection of facts from the recent past that do the exact opposite: they kindle the hope that we may yet catch history's hand and guide it along calmer, safer pathways." "I believe strongly that the values and spiritual qualities revealed in these chapters will ultimately prevail in the contest and that scientific knowledge of human needs will confirm the power of spiritual conviction to shape an entirely new international culture of preventive diplomacy and conflict resolution initiative." "This century has been one of the bloodiest in recorded history. Much that promised to enlighten and save us—religion, technology, education—seems only to have encouraged a more manic and efficient killing. 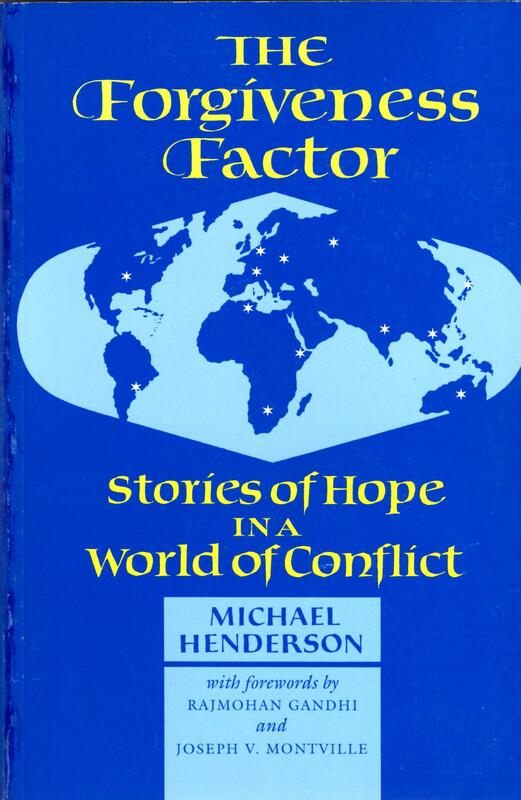 All of which makes Michael Henderson's new book, The Forgiveness Factor—Stories of Hope in a World of Conflict, a welcome discovery. It brings a piece of happy news: Some of the world's most bitter and violent enemies are forgiving one another. It is happening in Cambodia, in South Africa, in Japan, in Russia. In fact, in places where the most unbelievable atrocities have occurred, some of the people who have been most brutalized are leading the way to forgiveness." "The Forgiveness Factor offers a unique perspective and should be on the reading list for every international studies curriculum." British and American copies available from Amazon.